Is an American default inevitable? This week in the New York Times, Paul Krugman attempts to grapple with the ‘voodoo economics’ that threatens to force an American default. Paul believes that the Republican Party has ‘gone insane’ in its belief that no Democratic President can ever be legitimate. President Obama’s current offer to the Republicans on deficit reduction is actually more right wing than the average Republican voter. There have been signs of hope recently, but the question remains: how long can this face-off last before the US Treasury defaults? 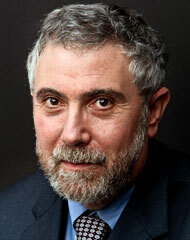 Global economy keynote speaker Paul Krugman is the professor of Economics and International Affairs at the Woodrow Wilson School of Public and International Affairs at Princeton University, Centenary Professor at the London School of Economics and the 2008 winner of the Nobel Memorial Prize in Economics.